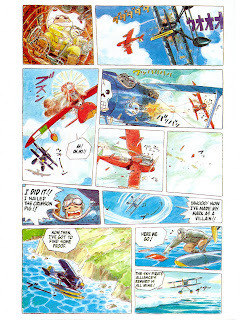 Hayao Miyazaki wrote and painted The Age of the Flying Boat in 1989 for Model Grafx Magazine in Japan. 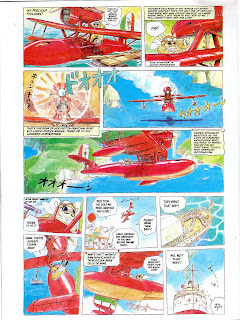 This story was later evolved and expanded into Studio Ghibli's 1992 movie, Porco Rosso. 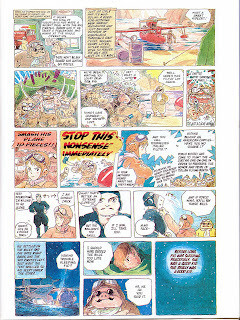 In 1993, Animerica Magazine scored an impressive scoop: an English translation, released in three monthly installments, as part of their extensive coverage of Porco Rosso and all things Miyazaki. This must have been amazing to read back then. Holding this comic in your hands was pure gold. There was no hope of ever seeing the movie, unless you knew someone in Japan. 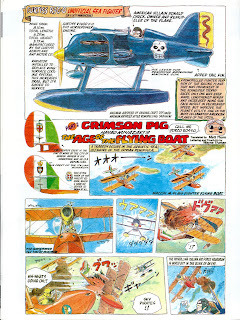 Porco Rosso wouldn't be officially released in North America until 2006! Oh, the dark days when Ghibli's films were impossible to find, copied and shuttled around on beaten videotapes among the anime underground. Even with the popular success of Katruhiro Otomo's Akira, and the hunger for "Japanimation" (Thank God that word was retired), Miyazaki would remain an unknown for another decade. What a wonderful luxury we have today with the internet. I am humbled and grateful that such works are now freely available. I've helped to play my role in bringing that about. 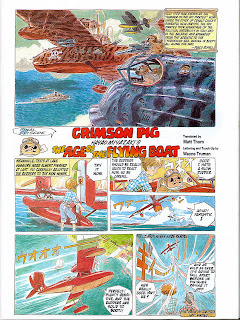 I hope you enjoy reading "Crimson Pig" in The Age of the Flying Boat, from the pages of Animerica. Nice find, simple and very Miyazaki. 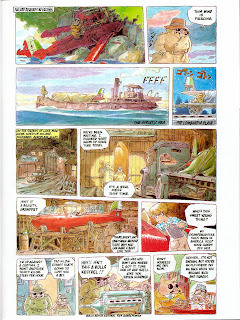 I wish Miyazaki would say what he uses to draw with besides watercolor. I've wondered this for Nausicaa too. 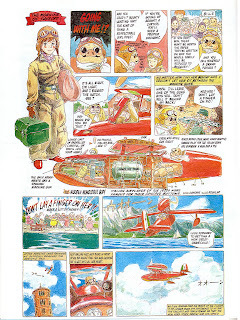 How do you suppose the gray shading is done in Nausicaa? He seems like he'd use traditional tools for his comics. 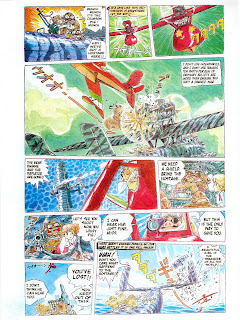 @Greentea: Nausicaa was black-and-white, so that would have been creative with pens and pencils. 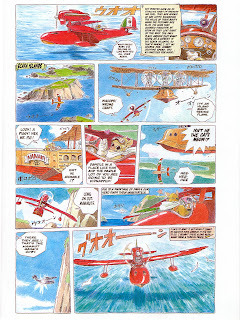 The color comics add in watercolors. 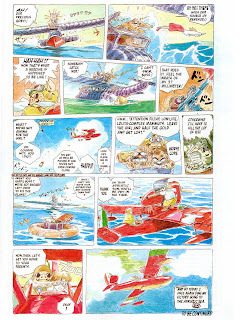 Somebody (like Viz) should publish a book of all the Miyazaki comics, like these short works for Model Grafx, as well as the short stories like Mononoke Hime, For My Sister, and Journey of Shuna. 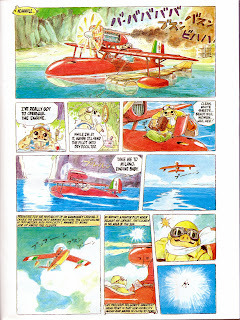 People of the Desert and the comic-strip versions of Puss in Boots & Animal Treasure Island would also be a must. A challenging goal, but attainable. @Michael: Yes, The Air Meal appears in Starting Point. I also posted it here on the blog a couple years back. 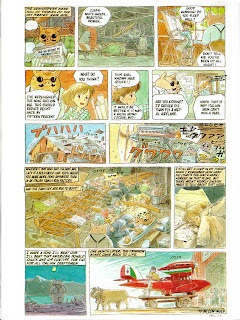 It's very insightful and enjoyable, as with all the Miyazaki comic. Add in Dr. Watson's (Sherlock Hound) cameo at the end...yay!! 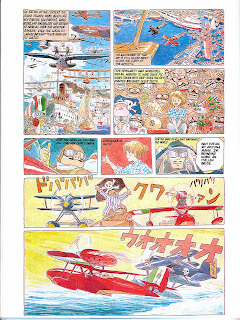 I also have the Miyazaki interviews that went with the Porco Rosso comic in Animerica, and I'll post those soon. This is great! 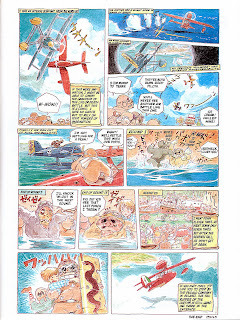 I picked up the Hayao Miyazaki Daydream Notebook when I was in Japan, which has this in it and is great to look at, but scant for non-Japanese readers. Thanks for posting it! I was wondering why they called the America character in Porco Rosso, "American" when he clearly has a Dutch flag on his uniform. Does anybody know? 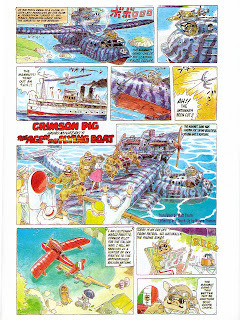 And if there is a story behind the reason why they use a pig character (or is it explained in the movie? I haven't seen it in more than 8 years). Ps: Daniel Thomas MacInnes, you're doing an awsome job!